Bruaich Mhor is a modern, well-equipped self-catering cottage located in Scullamus near Broadford on the Isle of Skye. The cottage has a double bedroom that comfortably sleeps two people. 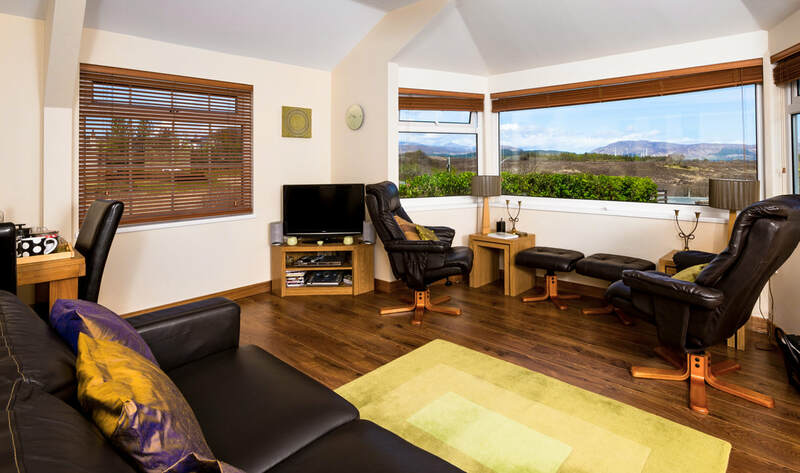 The main sitting room has an open plan kitchen with a dining area and large panoramic windows with superb views over the Red Cuillin mountains and Broadford Bay. The cottage is ideally situated to explore Skye and enjoy a range of activities including walking, photography, mountaineering and scrambling, cycling, fishing, kayaking, golf, wildlife watching and enjoying the amazing scenery of Skye. Around Broadford and Breakish there are some interesting mountain and coastal walks suitable for all abilities. The pretty fishing village of Elgol is a 30-minute drive and has beautiful views of the Cuillins and boat trips to Loch Coruisk. Over the Skye bridge on the mainland is the village of Plockton with a pretty harbour and seafood restaurants and iconic Eilean Donan castle at Dornie is not far away. The nearest village, Broadford, is a few minutes drive from the cottage. It has a supermarket, shops, ATM petrol station, pubs, cafes and several restaurants. For a special meal, Kinloch Lodge is nearby or the famous Three Chimney's restaurant to the north of the island. Bruaich Mhor cottage will provide you with a comfortable base with stunning mountain and sea views from which to enjoy and explore the magical Isle of Skye.